Reedley College was established in May, 1926, as Reedley Junior College. Institutional doors were opened in September 1926, with a total of 30 students and six course offerings. In 1936, a separate building on the Reedley High School campus was built to house the junior college administration and provide additional classrooms. On July 1, 1946, the college recognized its role as a total community college. By the late 1940s the governing board decided the time was right for the college to develop a separate campus and a separate identity. Thus, the board began negotiation to purchase the current campus site at Reed and Manning Avenues, once part of the historic Thomas Law Reed Ranch. In September 1956, the college moved to its present site where it has continued to grow and expand. It now encompasses 420 acres, including the school's 300 acre farm adjacent to the main campus. In 1963, the college became a member of the State Center Community College District, combining the resources of two of the oldest community colleges in the state. Reflecting the expanded area covered by the influence of the college, Reedley College officially became Kings River Community College in 1980. In accordance with the surrounding communities' wishes, the name Reedley College was restored in July, 1998. In the fall of 2001, more than 11,147 students registered at Reedley College (RC campus, South Centers and North Centers). The college offers associate degree programs, the first two years of a transfer program, and short-term career training programs. Reedley College was established in 1926 by the Reedley Joint Union High School District. For its first thirty years, the college shared facilities with the high school. In 1954, voters of the high school district overwhelmingly passed a bond issue to purchase the site of the historic T. L. Reed Ranch for a permanent campus. Two years later, in 1956, the new campus opened. Thomas Law Reed came to California in the summer of 1876. 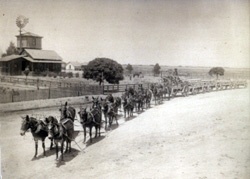 His apparent motivation in coming west was to investigate the prospects for farming. Interestingly, Reed's father, George, had also come west twenty-seven years earlier in a search for gold. For reasons still unknown today, George Reed never returned home. We may never know whether the elder Reed ever found his gold. But Thomas found his. T. L. Reed was born in Ohio in 1847. With his father missing, times were difficult for Reed's mother and his five siblings. Necessity dictated that the Reed children learn about hard work at an early age. During the Civil War, Reed's two older brothers joined the Union Army. As the oldest son remaining at home, the fourteen-year-old Reed bore many family responsibilities. But T. L. yearned to join the army like his brothers. Brother John tried to persuade T. L. not to enlist by telling him that his mother needed him at home and that the horrors of war were something he prayed his younger brother would never have to experience. Reed was unconvinced. In 1864, at age seventeen, he volunteered to be drafted as a substitute for another man. Reed hoped that the extra money that he got for being a substitute would help make life a bit easier for his mother. T. L. sustained a shoulder wound nine months later. Before his wound could completely heal, the war ended and he was discharged from the army. The veteran of Sherman's march to the sea and other battles was able to return home. His brother, Daniel, wasn't so lucky. He died of wounds at Bentonville. Reed married Amantha Ann Smith in 1868. They made their first home in Chester Cross Roads, Ohio, and engaged in farming. Later, the Reeds lived in Michigan while T. L. was in the cheese making business. The trip to California in 1876 had revealed opportunities for farming in the Woodland area of Yolo County. It was here that Reed's family joined him in late 1876. By then the family included three children, Horace, Nina, and Edmund. The Reeds' first-born son, Daniel, had died at age three. While in Yolo County, the Reeds rented land and grew wheat and barley. Among those from whom he rented land were officers of the 76 Land and Water Company, the entity that was selling land and building an irrigation system for some 30,000 acres in southern Fresno County and northern Tulare County, east of the Kings River. Reed's landlords encouraged him to consider moving to the "76 Country" to farm. In 1883, Reed traveled south to get a first-hand look at what this new area had to offer. What he saw made him enthusiastic. In March of 1884, Reed made his move to what was then known as Smith's Ferry, Fresno County, to begin farming. Popular accounts say that he came with "eleven head of horses and mules, and $1,000 of borrowed money." With these few resources, Reed immediately went to work plowing and planting wheat seed on 200 acres of land. He returned to Yolo County in the summer to harvest his last crop there. Then, in the fall of 1884, the Reeds moved permanently to Fresno County. 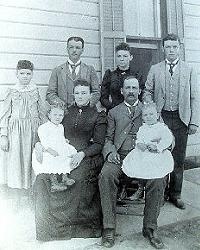 The Reed family - now one member larger with the birth of daughter Jessie (another daughter, Sarah, had died soon after birth) - established their residence in the old Smith's Ferry Hotel building, near the present Olson Avenue bridge over the Kings River. The ferry and hotel had ceased operating in about 1874. The deserted property was acquired by the 76 Company in 1882. T. L. Reed began a steady expansion of his farming operation. In 1886, he purchased over 1,200 acres, including the parcel that is now the college campus. The Reeds built a home on this property in the same year, and thus established what was to be their "Home Ranch." Two more children were born to the Reeds, Imogene and Dollie. In 1888, the Southern Pacific Railroad was building a branch line through the area heading south to Porterville. Reed deeded a half-interest in a 360-acre town site to the Pacific Improvement Company, a Southern Pacific subsidiary, and in return they established a depot. This new town needed a name, and the railroad determined that it should be "Reedley." Soon, buildings and streets grew amid the wheat fields that paralleled the railroad tracks. Reed built and owned the town's first hotel, livery stable and blacksmith shop. He established the first warehouse using a 500-foot long building hauled in from Traver. He donated land and helped establish the area's first school. He helped build the first church, and helped furnish a second. Reed was a founding director of the Alta Irrigation District (which assumed control of the canal system of the 76 Company), and was among the first to lobby for the building of a dam on the Kings River. Reed farmed 15,000 acres in the 76 Country and another 14,000 acres in the Chowchilla area at the peak of his farming activities. Pioneer historian, John McCubbin, who knew and worked with Reed, wrote that Reed "was known as one of the wheat barons of California." Unfortunately, financial security was never a sure thing for pioneers. The Reeds suffered great losses when the wheat market began to collapse in the early 1890s. An interest in the new-found oil fields of the Bakersfield area helped the Reeds recoup some of those losses, as did diversification into the farming of grapes and tree fruit. The prosperity that the Reeds enjoyed did not seem to alter their life style or character. Hard work was the rule and neighborliness the practice. McCubbin wrote that when fellow settlers "needed seed, feed, or provisions, they would go to T. L. Reed, who never refused them. He never made a book account of such loans, but trusted to their honesty and never dunned them. He would never take a cent of interest. There was nothing in the way of arrogance or egotism in the nature of Reed. He would stop to chat . . . with the most humble man in a group." Amantha Reed was known as always ready to spend days or nights with neighbors in childbirth or suffering illnesses. T. L. Reed died in 1911 at the age of sixty-four. Amantha died five years later. Both are buried in the Reedley District Cemetery. 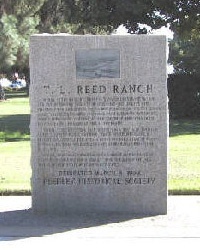 On March 8, 1992, the Reedley Historical Society installed and dedicated a granite monument commemorating the establishment of the historic T. L. Reed Ranch. The monument is located near the corner of Reed and Manning Avenues, a few feet from the college flagpole.